Researchers at the Los Alamos National Laboratory used supercomputers to model ocean vortexes and their effect on floating oil rigs. Their work has won industry awards — increasing safety and reducing potential harm to deep sea environments. A simulation of vortex induced motion shows how ocean currents affect offshore oil rigs. Courtesy LANL. The security and efficiency of fossil-fuel extraction methods is increasingly important to an industry seeking to balance environmental concerns and profitability. To meet this goal, they to turn to US DOE Los Alamos National Laboratory (LANL) supercomputers to understand how turbulent ocean currents affect floating oil rigs. LANL's simulations point to a safer way to pursue an all-of-the-above energy strategy. From human genome research to cutting-edge solar cell technology, LANL seeks to solve US grand challenges through scientific excellence. Their ability to create high-quality computer simulations makes them a chief resource for companies looking to incorporate high-performance computer power into their product development process. 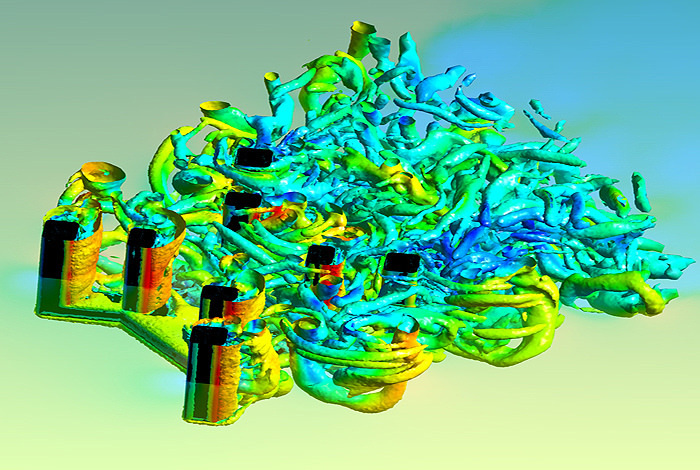 LANL's recent simulations to model vortex-induced motion (VIM) and limit threat to oil rig safety have garnered a finalist award from the ANSYS Hall of Fame. The annual competition showcases some of the most complex engineering simulation images and animations from users all over the world. VIM occurs when there are highly turbulent flow and fluid-solid interaction phenomena. Since the available experimental field measurement data is very limited, the complex physics and large scope of the problem calls for advanced numerical simulations using high-performance computing. Enter LANL's Advanced Simulation and Computing (ASC) program, home to two of the world's most powerful supercomputers. Spernjack said that it is important to minimize drilling platform motion caused by vortex shedding from ocean currents. Vortex shedding affects the integrity of key components such as the riser and mooring systems of the offshore drilling station, which directly impact system and environmental safety. Vortex shedding behind a circular cylinder. In this animation, the flow on the two sides of the cylinder appears in different colors, to show alternation between the vortices from the two sides. Courtesy Cesareo de La Rosa Siqueira. In the VIM study, Los Alamos researchers focused on floating structure that results from complex fluid-structure interaction and vortex shedding from sea currents. The team performed a comprehensive parametric sensitivity study to test different turbulence models and other modeling parameters. The researchers confirmed the computational fluid dynamics results using extensive experimental measurements in a tow tank facility, which tests hydrodynamics and creates functional waves. The simulations reveal insights into the physics of vortex shedding and VIM at different length and time scales. The immediate benefits include design optimization for large floating structures, and possible strategies for limiting VIM.